The bit has a significance which is rarely understood within the horse world. It is rarely understood because we seldom look at the subject with clarity and honesty. 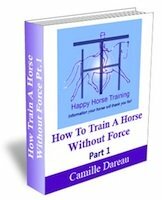 Usually it is used to control a horse because it causes discomfort and even pain in a horse's mouth when riders pull on the reins. This sounds brutal but unfortunately it is the truth in the majority of cases. This however is not the full extent of the use that is made of the bit by most riders. 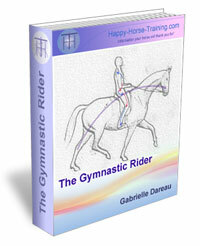 Most riders also use the reins as one of their main forms of support, to keep them balanced in the saddle. Many riders also use the bit to force their horse into a constricted neck posture and hold them there with the aid of spurs. Taking into account the fact that horses are flight animals, and restriction of their flight impulses causes them stress, especially restriction which also causes them pain - in their neck and back, as well as their mouths - it's surprising there aren't more accidents. I think there aren't more accidents because horses are particularly adept at tuning-out of such difficult circumstances and apparently coping with them. They are not really coping though, and later on in their lives - or in a situation where they feel safer, or simply because they have come to the end of their tether - the trauma reaction will manifest itself. Sometimes it won't manifest psychologically but physically, usually as a state of high tension which converts gradually into stiffness over time. Riding school horses and ponies can be the most obvious example of this kind of buried traumatisation. Sometimes when people become aware of such uses of the bit, they will he advocate riding with a bitless bridle or without a bit at all. This will definitely cut out damage to the horses mouth. In some cases it can be out of the frying pan and into the fire however, because bitless bridles are a strong tool, especially if they are designed with leverage. They act on the nose and the poll and they can even cut off a horse's breathing. The other reason we have found riding without a bit unsatisfactory is the same reason mentioned at the beginning of this page. The rarely understood value of the bit. But before discussing that it is important to say that if a problem isn't resolved at it's source, it will always show up in a different way, somewhere along the line. If the rider is using the bit as a mechanism either to stop the horse with, to stay on board the horse with or to hold the horse's head in with, then the source of the problem in each of these cases is the actions of the rider. Solving these problems is therefore a case of the rider learning how to control the horse with their posture and not the reins. 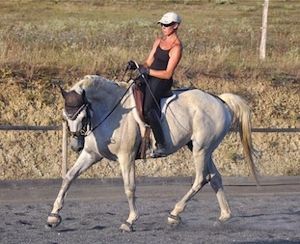 This is one of the results of learning how to balance independently of the reins and once the posture is mastered even moderately the rider will understand the futility and dare I say it stupidity, of forcing a false neck position from the horse (as shown in this photo). Considering the widespread occurrence of this way of riding at the 'highest' levels it is not something that should be ignored. The reason that the rider will understand the futility of fixing a horses neck is that when the rider's posture is correct even to some extent, the horse will as a direct result correct his own posture and begin to bring himself into the shape which is desired. The difference in the result is worlds apart from the forced one however, because when a horse holds himself in this way as opposed to being held, the energy will flow uninterrupted through his body and his rider's body, bringing them together in a harmony of flow and freedom. Horses enjoy this feeling, just as we do. Comparing this with the caricature which results from spurs forcing the horse into the wall of the tightly-held bit, all manipulated by a rider who is not in balance (if a rider is not in self carriage, how can the horse be?) is like comparing a garden and a parking lot. The significance of the bit is that it can be one of the beautiful keys to your riding relationship with your horse. The main key will always be your seat. However one of the extensions of your seat, and a part of the ring of engagement, is your connection with the horse's mouth. Any part of the horse's body you connect with is a key to their power and acceptance of you and entering into partnership with you. As in all the interactions we have with horses, comfort is of the highest priority, and comfort of the bit - which is going in the horse's sensitive mouth after all - is vital. As controlling a horse comes from their acceptance of the engagement posture, this includes their acceptance of their bit. Acceptance of the rein-contact is digital, it is either happening or not in any one moment and it depends on a multitude of factors. The actual relaxing of the jaw to accept the contact is obviously an imperative in the engagement of the horse, but it is only one link in the chain, and the bit has only one role when correctly contacted by the rider. Click here for a full explanation of What 'on the bit' really means. For this reason we don't understand why there is ever a requirement for other than a comfortable snaffle bit. The use of a double bridle, when honestly considered, is an implement often used to cover up a lack of correct training. A horse will obviously react to pain caused by the leverage of a chain against the jaw, as well as two bits against the tongue, by raising himself up in a pseudo-balance, and giving in his jaw in a pseudo-release. The problem is always the same one however, in that he is not raising himself up in a postural effort in reaction to the postural effort of the rider. He is just running away from pain, and running horses are neither happy nor under control. 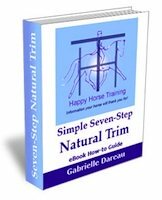 Your horse's bit itself must be the correct width - about a quarter of an inch visible at either side is ideal. Less than that and it is likely to pinch and maybe rub the corners of the mouth. If it is too wide, the balance in the mouth will not be good and if it is a jointed bit, the angle it sits at will be pushed into a more acute position, like trying to fit something too long into too short a space, it has to bend too much and may push into the tongue or roof of the mouth. The height of the bit should be dictated by the position of the first molars, and sits a few fingers width down in the mouth from them. If a horse has a small mouth though, this might pull the lips back quite a lot. In that case you have to compromise a bit between the two. You aren't doing your horse a big favour by letting a bit sit low in the mouth though. The lower it sits, the narrower the horse's jaw is at that place, and the more acute an angle the bit will sit at, poking into the tongue again, or roof of the mouth. A well as the danger of encouraging the horse to put his tongue over it. Of course if it is too high it will pull the lips and even bang on the first molars. It's a good idea to habituate your horse a little to having his mouth explored. You can then get a better idea of the shape and how much space there is. Watching out for teeth, try to feel for the size of the tongue, the height of the palate and the position of the first molars. A big tongue means that the bit is more likely to sit into the tongue itself rather than on the bars. In this case you want a very smooth link in the bit. With a very large tongue, a low port would help to give the tongue space, as long as there is room below the soft palate. A low palate means there is less space for the link to rise into, so a bit with a nutcracker effect should be avoided, and the bit itself should not be too thick. In general if we have a horse with an average to large size of mouth we prefer a nicely shaped snaffle, made out of an aurigan-type alloy, (which is less cold against the mouth) and with a nice round lozenge in the middle. 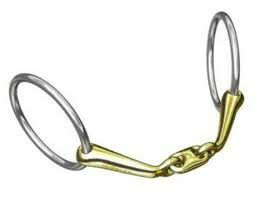 If we have a horse with a big tongue, a low palate or both, we find the Myler comfort snaffle (#1 and #2 which don't have ports) a very good option. The central link is flush with the rest of the mouthpiece and the whole bit is nice and slim. There is also no 'nut-cracker' action with this bit. For the initial training period with young horses off the lunge, it is a good idea to use big bit rings, D-ring or fulmer bit shanks to make sure it stays in place while the horse is learning to turn. These will become unnecessary later on.